Learn more about this "majikal" land and GET YOUR COPY of Everhome today at Amazon or Barnes and Noble. 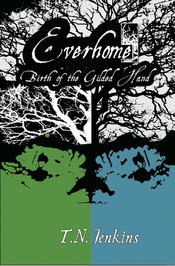 Finished reading Book One of Everhome? Review it on Amazon! Visit the Author Press Kit for a short Q & A with the author. When a talentless amnesiac wakes up in a pile of leaves, she follows a trail of clues home. But can she survive the vengeful wilderness of Everhome and an army of zealots who will stop at nothing to prevent her from opening a mysterious blue door? Would you survive the solution? When a talentless amnesiac wakes up in a pile of leaves, she follows a trail of clues home. But she must survive the vengeful wilderness of Everhome and an army of zealots who will stop at nothing to prevent her from opening a mysterious blue door. We are unable to accept queries and submissions at this time. But if you have questions about True Story Press, our titles, or our contests, please contact us! We believe everyone has a story. What's yours? Copyright (c) 2012 | info@truestorypress.com | True Story Press, Stories to Live By.